Add some excitement to that one bare wall you've been staring at. 1. A tropical looking tapestry that's honestly perfect all year round. Get it on Amazon for $18.80. 2. A set of mirrored butterflies to add a little fairy-like charm to your room. Get it on Amazon for $1.35. 3. A square shaped shelf for showing off all your best tchotchkes. There's even a corner dedicated to a little house plant. Get it on Amazon for $46.99. 4. A set of two bird-shaped whistle keychains who'll live in their own birdhouses until it's time to fly the coop. 5. A decal set of tiny triangles to jazz up any bare wall. Give your plain, boring walls a makeover. 6. A dry erase, light-up speech bubble that illuminates your thoughts. It comes with a marker and stencil so you can really get the word out. Get it on Urban Outfitters for $29.99. 7. A set of six geometric accents to make your room look super fancy. For added flair, you can stuff a little bit of fabric in them. Get it on Amazon for $29.99. 8. A dinosaur head for startling possible intruders. Get it on Amazon for $71.11. 9. A trio of diamond-shaped mirrors that hang on luxurious chains for some serious primping. Now you can admire yourself x3. Get it on Amazon for $37.99. 10. A shiny metal garland you'll be over the moon for. Get it on Urban Outfitters for $18. 11. A floating book shelf that's so convincing it might make your friends suspect that you're a wizard. Now you just need to get accepted to a mysterious academy and get a pet owl. Get it on Amazon for $11.95. 12. A tiny house for all your jewelry to live in. Finally, a house you can actually afford to make a down payment on. 13. A fox hook that will make you want to hang up everything. Get it on Amazon for $9.99. 14. A Society6 tapestry with your favorite artist's work on it. Society6 has a ton of amazing tapestries designed by artists around the world. It would be impossible not to find to find one you like. For example, this mermaid is pretty stunning. Get it on Society6 for $36.55+, or check out the whole collection. 15. 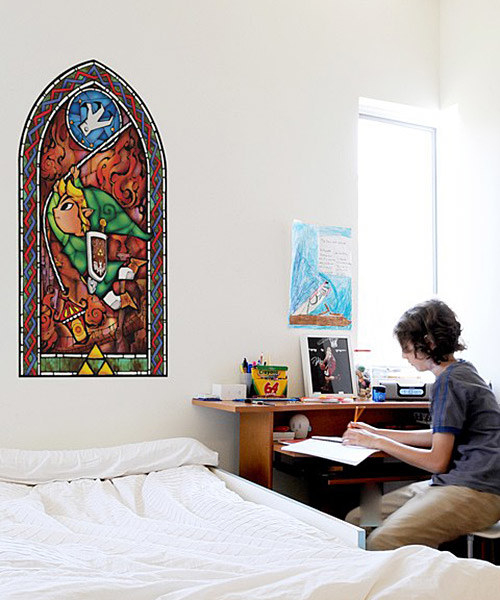 A set of decals that look like Zelda-themed stained glass for when you can't afford to actually make your room a video game church. 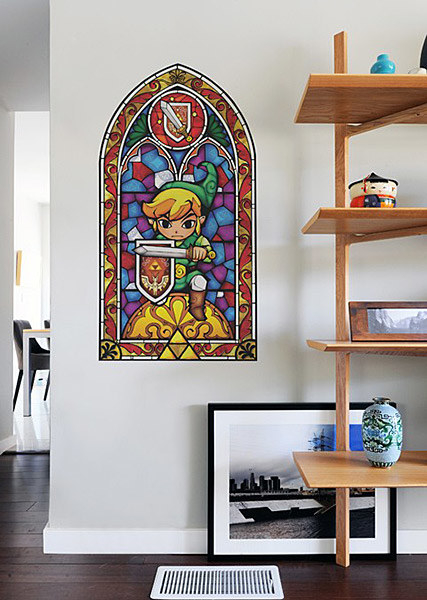 Add these decals and make your Nintendo Switch the altar. Get it on ThinkGeek for $19.99. 16. Two embroidery hoops connected with a game of Cat's Cradle. Perfect for the nostalgic decorator. Get it from Kitsch and Stitch on Etsy for $75. 17. A collection of dog decals to make any room instantly better. Every room should have at least one dog item. Get it on Amazon for $20.50 (available in green, pink, navy, and black). 18. A ferocious looking bear wall mount that will tear off your bottle caps for you. Crack open beers the most rugged way possible: In the jaws of a bear. Just don't try this with a real bear. 19. A bottle cap map for showing what a well-traveled drinker you are. You know how sometimes you find a really cool bottle cap and don't know what to do with it? Now you can showcase them! 20. A sheet of gold polka dots to add some charm to any wall. Get it on Amazon for $14.90. 21. An arrow lamp that you can point at the most important thing in your room (your bed?) (the fridge?). 22. A cardboard unicorn bust for when you don't have the heart to hunt the real thing. Also, we're not entirely sure if unicorns are real. Get it on Amazon for $20.99. 23. 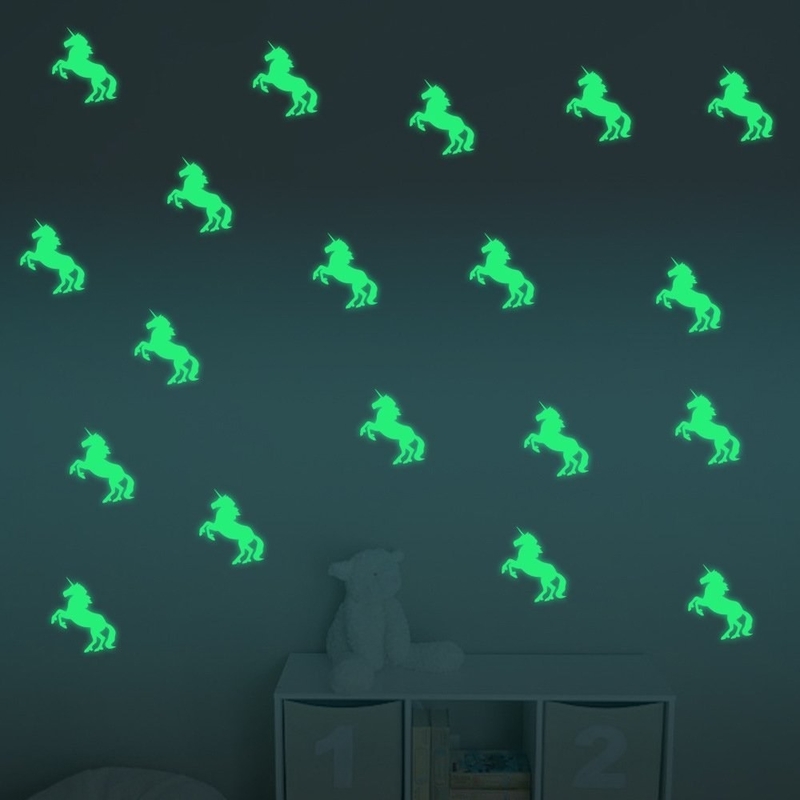 A set of 10 glow-in-the-dark unicorns to create a truly magical room. You can even use them to line hallways so you can make it to the bathroom without knocking into anything. Get it on Amazon for $6.15. 24. A DIY fox papercraft for when you want the illusion of wildlife breaking into your home. Yes, you have to construct it yourself, but then you get a cool geometric fox coming out of your wall. Get it from Paperwolf on Etsy for $65.61. 25. Or a actual gold fish to pop out of your wall. Add a bunch and have a whole school of fish in your home. Get it on CB2 for $12.95. 26. A cat sticker for a slightly more exciting time turning on and off the lights. 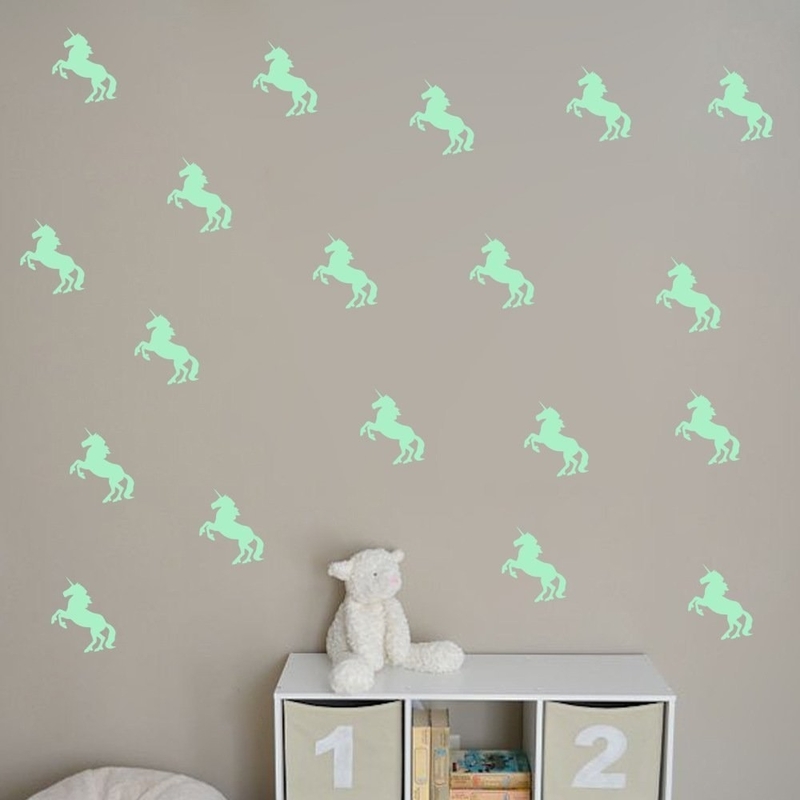 Make the most boring part of your home the cutest with just one decal. Get it on Amazon for $0.45. 27. A giant moon decal to put your glow-in-the-dark stars to shame. A big, glowing moon is way cooler than a night light. Get it on Amazon for $16.98. 28. A giant pair of mirrored glasses that just might give you a Great Gatsby flashback. Luckily this pair shows your face instead of the eyes of T.J. Eckleburg. Get it on PBTeen for $189. 29. A set of decals to transform your room into a retro game of Mario Brothers. For people who can't take their eyes off the screen. 30. An oversized feather that we hope no giant birds are looking to retrieve. Get it on World Market for $24.99. 31. And a darling decal that makes it look like a robin has come to perch on your doorframe. Unless you're Cinderella, not a lot of little birds are going to stop by, so you need to get creative. Get it on Etsy for $7.17. 32. A demanding metal sign perfect for any rustic kitchen. Not that anyone needs to be told what to do when there's food around. Get it on World Market for $9.99.